Hardwood Flooring Long Island, refinish, restore, repair, install. 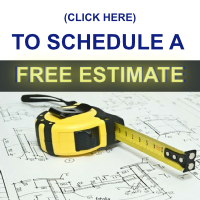 Searching for “cheap hardwood floor refinishers? Some people searching for cheap hardwood floor refinishers only focus on the cost per square foot or the overall cost of the hardwood flooring refinishing job. At Advanced Hardwood Flooring Long Island NY we are honestly not trying to charge more than the fair and reasonable cost for hardwood floor refinishing jobs. We have been refinishing wood floors for 70+ years (3rd generation family owned and operated). So we know what it costs to do a wood floor job the RIGHT WAY. We do every wood floor job as if it were in our own home or family or friends’ home. The dips and divots in the floor above were created by an un-experienced or careless wood floor contractor during the floor sanding process. The sanding machines professional wood floor contractors use for hardwood floors are powerful and can do a great deal of damage in the wrong hands, sometimes even ruining the wood floors beyond repair. 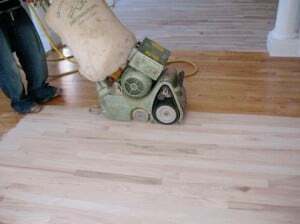 Take a look at a hardwood floor sander in this photo. It has a powerful motor than spins a sandpaper belt at high speeds. If you are not moving the sander across the floor at a steady, even pace you will get an uneven floor. If the operator pauses in place for even a split-second, the floor will get divots worn into the wood. If a wood floor contractor is doing a rush job to save time and money, your floor will not have that smooth, seamless shine that is expected on hardwood floors. Each pass of the belt sander should move smoothly, at a steady and slow pace, across the entire length of the floor, and in the same direction as the floor boards and grain of the wood is. You just can’t rush this. Well, you could, which is when you end up with wood floors that look like this unsightly, embarrassing mess in the photo below. Not only is this nightmare of a floor riddled with divots (you can clearly see where the belt sander rested too long in spots), this floor also shows us that the operator was moving the sanding machine across the grain. Yikes! Look at all the lines diagonal to the wood planks. This wood floor is laden with divots from a careless hardwood floor contractor. 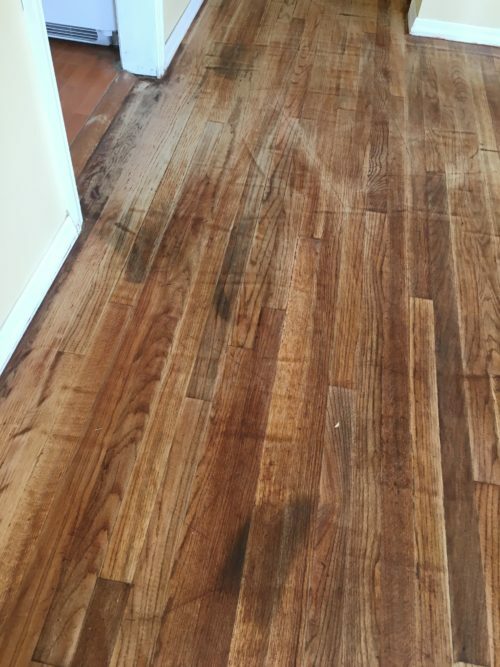 Think all wood floor refinishers do the same quality job? Think again. 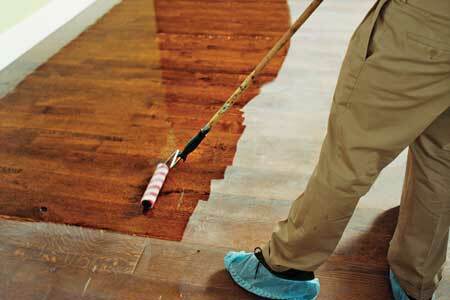 Wood floor sanding requires a delicate and experienced touch. And there are several stages to the process that need to be done right or your floors will never look good. The proper way to sand down wood floors is to go over them several times, each pass with a finer grade sandpaper, until they are as smooth as a fine piece of furniture. And it iss a multi-step process. Once we are done with the Belt Sanding Machine, we switch to an Orbital Sanding Machine (shown in photo below). This machine is for fine sanding and cutting the grain between coats of varnish. What does that mean? Well, when you lay the first coat of sealer on freshly sanded hardwood floors, the tiny wood fibers tend to rise and stick up. 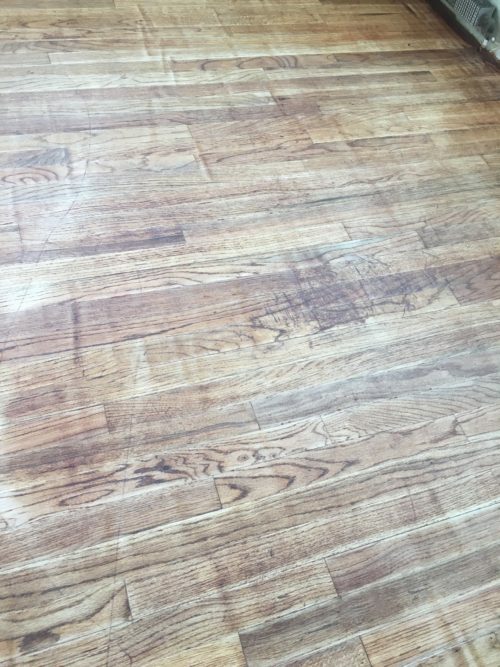 This wood floor contractor skipped a step to save time and money. They failed to “cut the grain” between coats of floor finish. 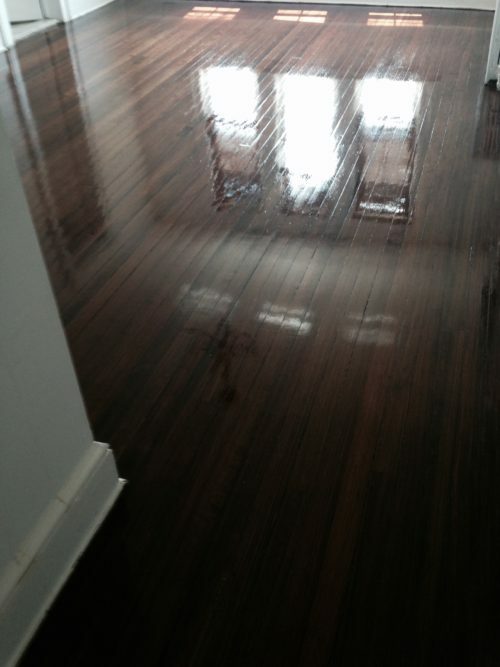 Fortunately, we were able to restore the damaged wood floors in this home and repair them back to new. But it cost this homeowner not only the extra cost for us to fix it but the TIME, TROUBLE and aggravation. What kind of machines will they use to sand down your wood floors with? How experienced is the operator? How many coats of varnish will they use? Will they do any sanding between coats to “cut the grain”? Will they be carefully cleaning before and after all coats of varnish to minimize dust? Will they be turning off Air Conditioner, heater, or fans to minimize dust during wet coat applications? You should also ask to see photos of their work. 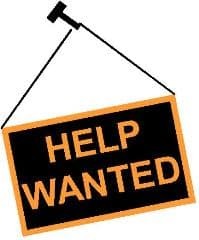 Good luck and well wishes to all of you who are searching for a discount hardwood floor contractor. 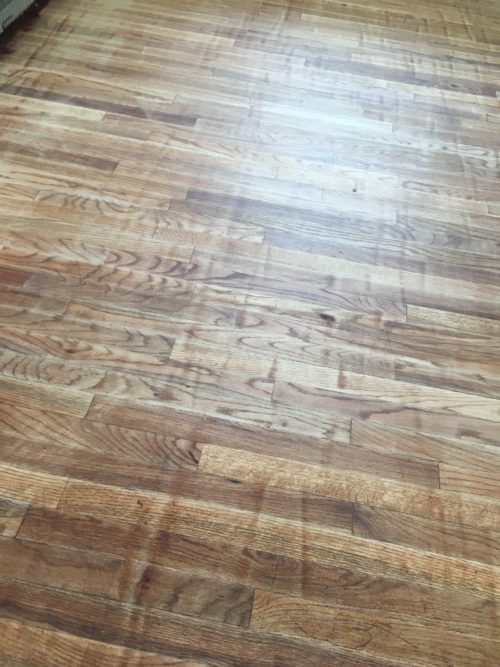 We believe our company offers the most QUALITY and VALUE for the cost because we know we care enough to do all our hardwood floor refinishing jobs as if they were our own floors. Advanced Hardwood Flooring, Inc, located in Westbury Long Island NY proudly services Nassau County and Western Suffolk County, New York. Ask about our 4-HOUR sandless Floor Shine Special! When you need your floors to shine fast! Toxic Hardwood Floor Testing. If you think you may have flooring installed that contains unacceptable levels of Formaldehyde as discussed on CBS 60 Minutes expose, please contact us. 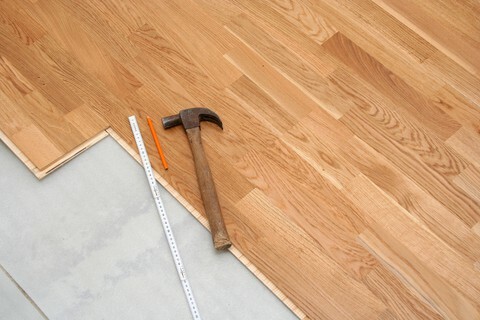 We provide cost-effective testing of hardwood flooring.